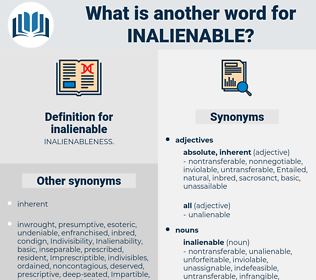 What is another word for inalienable? 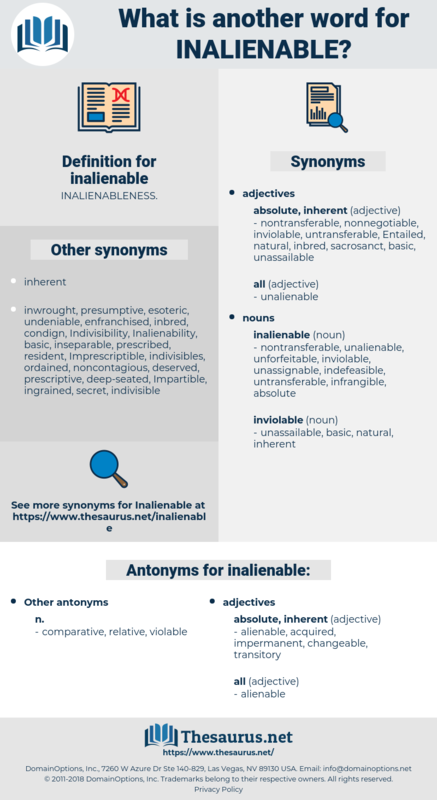 Imprescriptible, inescapable, indissoluble, indissociable, inextricable, incontrovertible, disposable, non-derogable, essential, immutable, inviolate, sacrosanct, unquestionable, sacred, invariable, absolute, legitimate. inseparable, indispensable, indivisible, undeniable, irrevocable, inherent. alienable, acquired, impermanent, changeable, transitory. conveyable, defeasible, appropriable, negotiable, transferable, transferrable, assignable. Since Mrs. Browning's time, education has become, not the privilege of a few women, but the inalienable inheritance of all; and, as a natural consequence of the increased faculty of expression thereby gained, the women poets of our day hold a very high literary position. The lawyers had made a Constitution of the United States, but the true American constitution - the one written on the people's hearts - had always remained the immortal Declaration with its assertion of the inalienable equality of all men.